Your baby’s skin has become opaque (it had been see-through), but it is still immature. The retina of the eye continues to form, but that also is not mature yet. The circulation to the lungs is forming, and the lungs are beginning to develop surfactant (a substance that keeps the lungs from sticking to themselves), however the lungs will be one of the last parts of your baby to fully mature. His body has caught up with his head, and although the head is still large compared to an adult, your baby’s body and head are in the right proportions for a newborn. His brainwaves also resemble those of a full-term newborn. He is developing a sleep-wake pattern and may be developing an active time that is pretty regular from day to day. 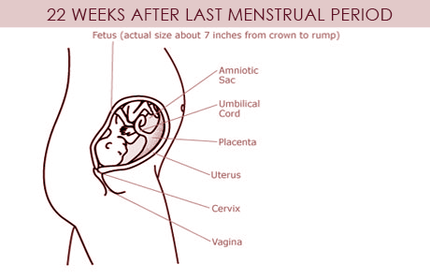 At the end of the 24th week your baby will be around 10 inches from crown to rump and weigh 2 pounds. For most women the second trimester has brought some welcome changes. The uterus is too large for the pelvis, so there is less pressure on the bladder, but the uterus is not quite large enough to cause real problems with eating and breathing. You should have more energy than you did in the first trimester, along with an increased libido. You should also be feeling the baby move every day. Weight gain should be pretty steady now, meaning only that you continue to gain weight, not lose it. The growing uterus may be causing stretch marks across your lower abdomen and sides. The pressure of the uterus may also be causing some constipation and heartburn. Your thyroid gland is more active during pregnancy, which may cause an increased perspiration. Some women find that the increased blood volume during pregnancy causes their gums to bleed and nosebleeds. Although still early, some women begin to have leaking fluids from their breasts. It is normal for the breasts to leak, and normal for the breasts not to leak. It will have no effect on your ability to breastfeed. These symptoms are commonly experienced during this month.